The sun shone, the sky was blue and the people of Tunbridge Wells turned up in their thousands to enjoy the 2018 Tunbridge Wells Mela. Held in Calverley Grounds, this is a very family friendly event, so I went along with my children aged 3 and 6 and we all really enjoyed an amazing afternoon full of wonderful music, dancing and food. The Mela is organised in partnership, by Cohesion Plus and the Kent Equality Cohesion Council with the support of Arts Council England. 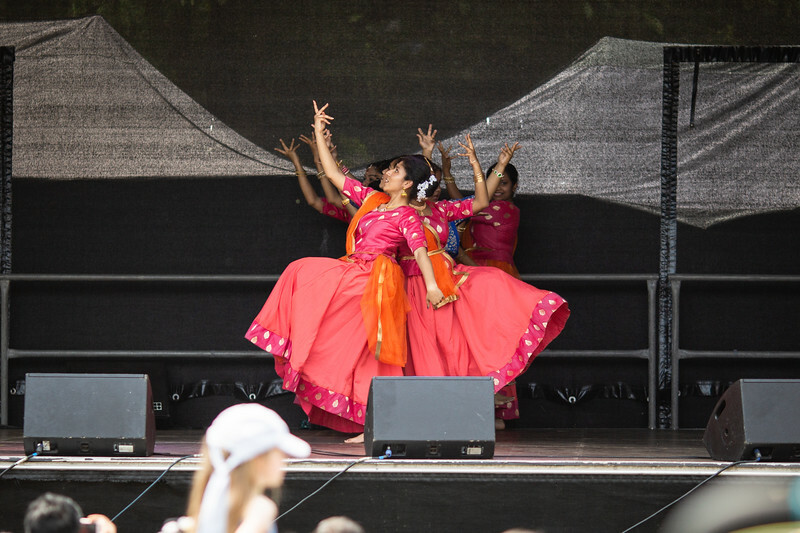 It's a free festival which celebrates the diversity of the local borough through music, food and dance. A large stage was set up at the Mount Pleasant Road entrance to showcase a wonderfully diverse programme of performers. These ranged from South Indian dance to African inspired Drum Beat, as well as fabulous local reggae artist Jack Curtis, some peaceful and beautiful Syrian music and then to get everyone up and dancing, The Folkin Fusion Collective match street dance with traditional North Indian Dhol Drums which was fascinating to watch and hear, as were the headline act, PBN, who had the crowd up and dancing. Off the stage, there were lots of food stalls selling delicious Thai, Chinese, Spanish and Indian food. At various intervals thoughout the afternoon, wonderful Chinese Lions snaked through the crowds, enrapturing children and adults alike. The guys inside must have been BAKING after each of their tours through the crowds! When the kids needed a bit of a break from the sun, we could wander to the far end of the park to play in the relatively new and brilliant playground which has a 'wet' sandpit which was wonderfully cooling on such a hot day! If you've never made it down to the Mela before (like me), definitely put it on your radar for next year. It was such a different and really fun afternoon for all ages, I can highly recommend it!